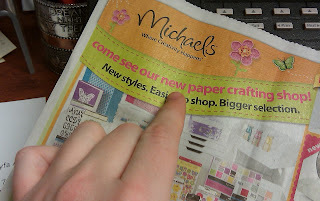 SCRAPiVERSE: The 'NEW' Papercrafting 'SHOP' at Michaels?? Did anybody else see this ad and get as confused as I did? What? NEW? PAPERCRAFTING SHOP? AT MICHAELS? Excuse me, but WHERE at or in Michaels is this located? I know the stock at Michaels better than any employee there- seriously. I know what they carry, how much they carry, what they sold last week, what didn't sell last week, and how much they'll probably move by next week. The need to hire me. I usually go to Michaels on my lunch hour- that way, I'm out of the office for an hour, and after 5, I can go home and play with my new supplies instead of spending that precious time out buying the supplies. I know, I know, I'm a genius. But because I go to Michaels on my lunch hour, I'm usually wearing my 'badge' on a lanyard, the keycard thingy that unlocks the door to the office- you know what I'm talkin' about. Well, it's amazing how a keycard on a string can make a guy look 'official,' because while I'm searching through the shelves at Michaels, I'm often appoached by a customer who thinks I work there- and needs help finding things. Usually because they asked a cashier first and got was told, 'Well, IF we have it, it'll be over there.' And then they wave their hand in a direction that covers a wide area of any certain corner of the store. So, it's no surprise they mistake me for Employee of the Month when they see me on my hands and knees, straightening up stock on the shelves or putting lost items back on their pegs. What the @$!# am I talking about? Oh yeah- this ad. 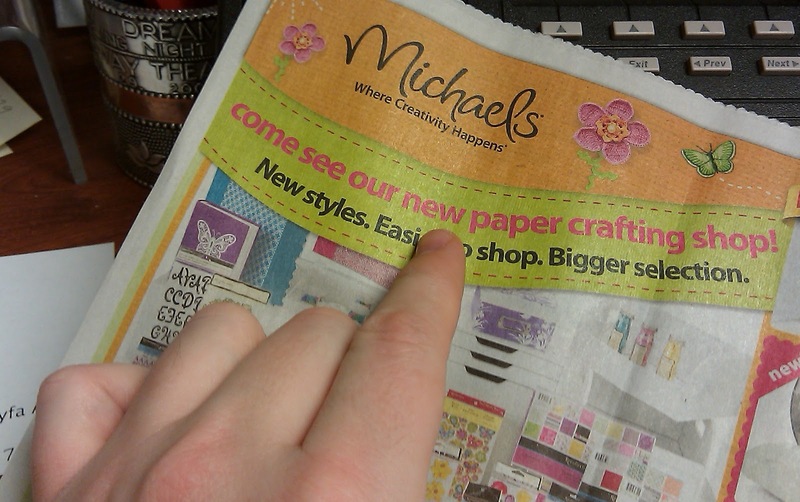 SO WHERE is this new 'Papercrafting Shop' in Michaels? Nothing has been moved around at my local store. There's no 'more styles.' Unless you count a little rack of Recollections' finest plastic 'bling' or fifteen more stacks of Jolee's worst- I'm missing something. Has anyone seen any changes at their Michaels? So funny because I received the same thing as an e-mail. Other than my Ms moving the scrapbooking section to the other side of the store and adding some Smash products, there is nothing new. I went to ACM the other day and I overheard a customer explaining to 2 employees what she was looking for (fiskars texture plates) and neither of them had any clue. I walked down the aisle, picked them from under some misplaced crap and asked if that was what she was looking for. Of course it was. I know my crap. I don't expect every employee to know every craft. But, really? Okay well I saw this and did some investigation. i called 5.. yes 5 to make sure I had rec. accurate and consistant information. All 5 of their managers told me that it is NOT anythign new persay. They have brough in new recollections. However all this really means is most stores are reoragnzing their crafting supplies to "make it easier to find things." and there have been more recollections items relaeased. However there is no new shop persay but them offering a new way to shop 3 outta 5 of the stores said they were suppose to already have the stores crafting sections reorganized by this week when the ad came out. But bascially it's just a new way their displaying and sorting the supplies. Hope this help! WOW!!! That is some in-depth research! I was pretty sure it was just marketing- but part of me couldn't help but think/hope that I'd walk into Michaels and see an amazing new stock of the newest products. HA! I was there yesterday, I did not see anything new! :( Maybe I will go look at my other one today and see! Will let you know! I did not make it to michaels today! Maybe tomorrow! Well, we all know how I feel about Michael's and their inept, uneducated employees, so I'm not surprised that they are trying to put one over on consumers. Hmmmm, do we have a case for "false advertising"? Perhaps you can put together a class action suit, Kory, LOL! Thank you so much! It was great to meet you! Can't wait til next time! Let's really tear up the next layout! Crap Kory! You seriously make me laugh.out.loud. everytime I stop by! Anyway, I thought the same thing when I saw the ad?! Thank you so so much! I love to hear that I'm making people laugh- it makes me feel good! And it's so much cheaper than crack! Oh my god this is SO TRUE!!! I had the exact same reaction and I'm totally jealous you go to Michael's on your lunch hour- the nearest one from me is an hour away but I still manage to go at least twice a week and NO I haven't seen any changes. In fact they are still trying to shill magazines from 2010!!! Perhaps they need to hire us both so we could whip their business into shape. Kep writing- I LOVE your refreshing real talk blogging style! What is up with the 2010 magazines?! LOL Kory you are so fun, love your blog posts, and yes I saw that too, I guess adding 3 products to their assortment counts as a new shop?? I don't know I have about 3 Michaels 10 minutes away from me and all 3 are the same, I went to one today didn't see anything so maybe they are just blabbing! I have seen no change at my Michael's. I have seen the ad and was excited about it. Until I got there. I was very disappointed. I do not work anywhere, so I don't even have the lanyard name tag. However, last week, I was approached by a middle aged lady. She said "Where are you ideas on crafts to make? I used to do a lot of different crafts but I stopped several years ago. I want to make something for a friend's birthday. What are some ideas?" I pointed her in the direction of the shadowboxes (on sale)and gave her some ideas on how to fill them. She thanked me and picked out all the items she wanted. That is my most unusual Michael's outing. Mostly it is just people looking for scrapbook stuff and I spend a lot of time in those aisles.